Backcountry ski touring and sailing expedition along the west coast of Spitsbergen, 1000 km from Norway and 1200 km from the North Pole. The Svalbard archipelago of over 60 mostly unpopulated islands is a wild and remote place, and at a latitude of greater than 79º it is level with Canada's Ellesmere Island, or the northernmost end of Greenland. Our 2019 Ski and Sail expedition in Svalbard is a journey into one of the most unique and surreal ski touring destinations in the world with its juxtaposition of sea, mountain, and arctic environment. Yet, it is surprisingly easy to access, with three-times daily airline flights into the modern airport at Longyearbyen. The west coast of Spitsbergen is protected by a long, thin island called Prins Karls Vorland, which protects an inner channel and allows straightforward sea access to dozens of fjords. The fjords harbour countless peaks rising 500 to 1000 m out of the sea, and offer outstanding ski touring opportunities. It is a land perfectly designed for skiing. Gaining access to these beautiful glaciated peaks is only possible by boat, as helicopter skiing is strictly forbidden in Svalbard. And a good thing, too: a sailing yacht is really the best way to visit this country, a tradition that has existed since whaling boats first made use of the area over 200 years ago. The s/v Noorderlicht, which we have chartered for this trip, is also the best boat around for the job. At almost 50 m (150 ft) long it's comfortable and stable and provides exceptional luxury with the classy lines of a gaff-rigged schooner. NO20-1: April 25-May 2, 2020. Optional pre-sail ski touring: April 23-25, 2020. NO20-2: May 2-9, 2020. Optional pre-sail ski touring: April 30-May 2, 2020. NO20-3: May 9-16, 2020. Optional pre-sail ski touring: May 6-9, 2020. Our 2019 Noorderlicht voyage is sold out. Price: $7,895 CAD/person (Currently $6,299 USD / €5,438 / £4,702). Pre-sail: Early sign-up bonus: Complete your registration before September 1, 2019 and join our Pre-sail ski touring out of Longyear City for no additional cost! After this add $800 CAD/person (Currently $750 USD / €663 / £573). Zero-rated tax (no GST). Backcountry skiing - from a Sailboat! We will base from a comfortable and spacious double masted gaff-rigged sailing yacht, the beautiful s/v Noorderlicht (Dutch for "Northern Lights"). This enables us to sample the best ski touring and ski mountaineering spots along the west coast of Spitsbergen. Given the long days in spring, there will not be any rush: around the clock the midnight sun provides an amazing soft light that is unique to ski touring this far north. Our goal is to ski tour every day after lifting anchors in Longyearbyen. Our skiing days usually last from 5 – 9 hrs. Due to the presence of polar bears, the guides will be carrying bear deterrents and firearms during the ski touring days. All in all an amazing adventure – a trip of a lifetime! For our guests who want to spend more time in this amazing area, we offer an optional 3-day pre-trip extension to do backcountry ski tours and / or a snowmobile tour based in the town of Longyearbyen, the main town of Spitsbergen. We will be based out of the Basecamp Svalbard hotel - an amazing hotel that is worth a visit to Svalbard just to see! At 870 km distance to the North Pole, Longyearbyen is the northern most town in the world, has about 2000 inhabitants, several nice hotels, a small town center with bars, restaurants, shops and a great arctic history museum. Usually, we can put on our skis at the hotel to explore nearby peaks and glaciers. Trip reports, Photos and an Online Topo Map! To get a better idea of what to expect from our Svalbard Ski and Sail 2019 ski trip, please check out my Svalbard photo album and my Ski Touring in Svalbard blog post about last season's Ski & Sail adventure. A great resource made available by the Norwegian Polar Institute is this topo map of Svalbard. Finally, our 360° Virtual Tour is a great way to get a feel for what to expect when you step on board the s/v Noorderlicht. This response will sound a little cliche, but I really don't think I would change a thing about this trip. Jörg and Tom are true professionals. If you were on the fence about going on a trip and then found out that Jörg and/or Tom were guiding...you'd go! The itinerary was great. Every location we stopped and toured had its own special feel. I truly enjoyed every day in this region. The stop to see the walrus and the night in Barentsburg/midnight skiing rounded the days out into memorable side trips. The only drawback to this trip is that it will now be the benchmark for all future similar excursions. I am always prepared to be a bit uncomfortable on ski/climbing trips but man, we were spoiled. The Noorderlicht was wayyyy better than expected. The boat and the crew were a welcome sight at day's end. Gabrielle always had a snack/soup ready for us...beer fridge was stocked. What else could you ask for. The food was amazing...I enjoyed every meal. This trip was a 10 in my book. Throw in Jörg, Tom and our whole like-minded group...I could bump it to an 11. Tom Wolfe (Mountain Guide ACMG/IFMGA) – Tom has been guiding since moving to Canmore in 1995, the place he calls home with wife, son and daughter. He guides year around, with winters being a mix of ski guiding at lodges, heli-ski operations, and remote backcountry destinations throughout western Canada. Tom is the owner of Sawback Alpine Adventures. He speaks English, German, and enough French and Spanish to get by. Nino Guagliano (Aspirant Mountain Guide, AMGA). Joining us for our NO19 trip, Nino hails from California where he worked for 15 years as a professional photographer. More recently Nino decided to follow his passion to become a mountain guide, persuing his Aspirant Mountain Guide designation with the American Mountain Guide Association. As a dual citizen with USA and Canada, Nino has chosen to move to the Canadian Rockies and finish up the last of his exams and now lives in Golden, British Columbia. Nino speaks English and Italian. Rob Coppolillo (Mountain Guide, AMGA/IFMGA) – Joining us for our NO20-1 trip, Rob spent his 20s racing bicycles but eventually settled down to become the 98th American mountain guide. Rob speaks English, French and Italian and is also a freelance writer and the author of Holy Spokes: a Biking Bible for Everyone and The Mountain Guide Manual. Rob is the owner of Vetta Mountain Guides and lives in Boulder with his wife and their identical twin boys. Jörg Wilz (Mountain Guide, AMGA/IFMGA/) – Joining us for our NO20-1 trip, Jörg runs OnTop Mountaineering out of Canmore, AB. Originally from Heidelberg, Germany Jörg settled in Canada many years ago attracted by the incredible heli-skiing. He still heli-skis winters in western Canada and operates his guiding business world-wide. 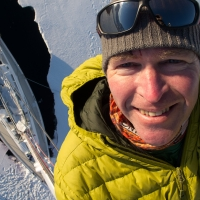 Phil Wickens (Expedition Leader, Noorderlicht Staff) — After completing his PhD in plant pathology, Phil worked for two winters and three summers as a field guide for the British Antarctic Survey, combining his passion for natural science with that of mountain exploration and photography. He has led numerous climbing and skiing expeditions to Antarctica, Tibet, India, Pakistan, Nepal, Peru, East Greenland, the Caucasus and Canada, and was Vice President of the Alpine Club in 2006-7. Phil works as a freelance photographer, polar guide, expedition leader, naturalist and lecturer in expeditions, polar geology and history. Phil’s home is on the edge of Peak District National Park in England. NO19 starts May 19, 2019 which is the day before our first pre-sail ski touring. You can arrive in Longyearbyen as late as early afternoon on May 22 as the boat departs around 17:00 PM on that day. NO20-1 starts April 22, 2020 which is the day before our first pre-sail ski touring. You can arrive in Longyearbyen as late as early afternoon on April 25 as the boat departs around 17:00 PM on that day. NO20-2 starts April 29, 2020 which is the day before our first pre-sail ski touring. You can arrive in Longyearbyen as late as early afternoon on May 2 as the boat departs around 17:00 PM on that day. NO20-3 starts May 6, 2020 which is the day before our first pre-sail ski touring. You can arrive in Longyearbyen as late as early afternoon on May 9 as the boat departs around 17:00 PM on that day. Day 1 (NO19: May 19, 2019; NO20-1: April 22, 2020; NO20-2: April 29, 2020; NO20-3: May 6, 2020): Arrival at the airport in Longyearbyen from Oslo (with SAS or Norwegian Airlines) in the early afternoon (usually one overnight required in Oslo). Transfer to our Hotel and time to check out the town including a visit to the “Polarmuseum”. Day 3: Ski touring day trip close to town or alternative a snowmobile tour to the town of Barensburg, as small Russian mining town. Day 4 (NO19: May 22, 2019; NO20-1: April 25, 2020; NO20-2: May 2, 2020; NO20-2: May 9, 2019): Potentially another shorter ski touring trip from town or a visit to an ice cave (4 hrs). Arrival day for those participants who chose to participate in the boat trip only . Embarkation around 4 pm at the earliest, safety briefing, departure from pier usually around 6 pm. We usually only sail one hour to our first ski tour in the Isfjord; harbours like Ymerbukta or . From there, we continue to sail along the West Coast of Spitzbergen to sample the best ski touring and peak ascent the group of islands has to offer. In May and June the sun will be with us for 24 hours in Svalbard, which leaves a lot of flexibility for our departures. After each day of skiing we return from the shoreline by Zodiak motor boat back to our Yacht, where the smell of dinner will usually welcome us. We usually finish the day on deck with a glass of wine, enjoying the contrast of the sea and the magnificent mountainscape with the everlasting sun above the horizon. Arrival back in Longyearbyen usually around 4 PM. Farewell dinner on the boat. We bid farewell to our Yacht and crew in the morning after breakfast and head back to the airport. We will fly to Oslo (Via Tromsø for a brief stopover if you fly with SAS; direct with Norwegian) from where we can catch our international connections, which may require an overnight. This year’s Svalbard Ski and Sail trip starts in Longyearbyen on Svalbard. There are at least 3 flights daily to Longyearbyen from Oslo, Norway. If you choose to only participate in the boat portion of this trip, you must arrive in Longyearbyen at the latest on Day 4 (see Itinerary tab). We will be boarding the boat at around 4:00 pm. There is an optional 3 days of ski touring offered (see above Itinerary tab for dates). If you arrive in Longyearbyen on Day 1 then you can participate in all three pre-sail ski tours, but you can also arrive later than that if you like. Please advise us of your intentions so we can make hotel bookings and other arrangements. There’s no fast way to get to Svalbard. That said, I do have some hard won advice. Finding a good deal on a good flight itinerary to Longyearbyen takes a bit of work. Book well in advance of your trip. Be careful of using the discount sites as additional luggage fees — charged for each leg of your trip potentially — can be pretty hefty. You will need two 20-kg bags so factor that into your planning. Look for and spend a bit of extra money if necessary to get flights with shorter (<4 hr) stopovers and as few connections as possible. I recommend you use one of the big airlines like KLM, Lufthansa, United or Air Canada all the way to Oslo, aiming to arrive in Oslo in the early afternoon. Then overnight in Oslo and catch the next morning’s flight to Longyearbyen with SAS or Norwegian airlines. In Oslo, the Radisson Blu Airport Hotel Hotel is a quick walk from the airport and very comfortable. The airport Best Western is a bit cheaper and has a great breakfast buffet but requires a $10 each way shuttle as it’s 3 km from the airport. If you arrive a few days early, Oslo is a great world class city to visit. On the way back, book a flight on the morning of Day 11 (see Itinerary tab for dates) to Oslo. If you are heading to a European city as your final destination you should be able to continue on same day. If you are heading across the Atlantic, plan to stay in Oslo again that night and catch an early flight back home, again with one of the big airlines. Svalbard Topo Map – Check out the amazing archipelago of Svalbard with this excellent online topo map. See the terrain that makes our Svalbard Ski and Sail so incredible. Polarmuseum website – Everyone who visits Longyearbyen has to check this place out. The North Pole museum is old and run down and not very good but still probably worth a visit. Blog post from our 2018 trip – A little blog post I wrote about the trip. You need to bring all of the following personal equipment. Please don’t bring extra equipment. If you have any questions at all about gear please do not hesitate to contact us. Ski crampons are a must for spring ski touring on Svalbard. If you have any difficulty obtaining these please let me know. We have some spares and can likely set you up with a pair. If you have telemark bindings, G3 crampons have an attachment system that works well for most tele bindings. Our Svalbard Ski and Sail trip has a special payment schedule: 30% deposit to secures your booking; an additional 30% payment September 1, and the balance paid Feb 1 before the trip. The exact details will be confirmed upon registration. How difficult is this trip? Day trips out of Longyearbyen for the first 3 days; remainder based out of the sailing boat. Tour lengths are 1100-1500+ m and 10-20 km travel/day. What is included with the trip fee? Included: 7 nights yacht rental with crew, harbour fees, permit fees, UIAGM / IFMGA mountain guides, multi-course dinners and breakfast on board. Pre-trip extension: 3 additional days of town based ski touring and excursions, 3 x Hotel B&B in Longyearbyen. What will the snow and weather be like? 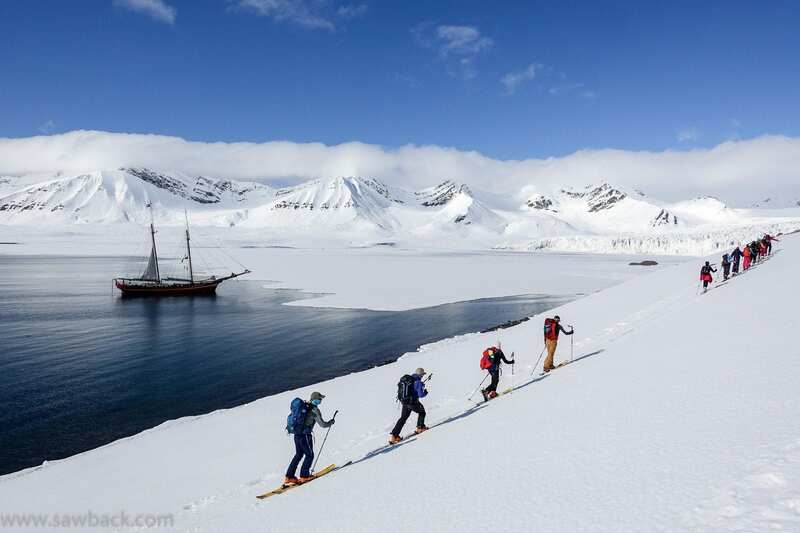 May is the month for Svalbard Ski and Sail trips. The temperatures are mild and stable, with lows typically around -5°C and highs around +2°C. The snowpack is typically stable and skiing of the spring corn variety for the most part, although often Arctic Pow can be found on the steep norths. The short answer to both questions is “No”. While it is possible we will see polar bears on this trip it is highly unlikely. Many tourists travel to Svalbard with the goal of seeing polar bears, and join trips that specifically go into the polar bear’s prime habitat — which is north into the pack ice. The goals of our trip are simple: to get the best possible skiing accessible by sail boat. This means sticking to the ice-free waters further south. As a result, I have to disappoint those of you hoping to see polar bears. At the same time, polar bear safety is always an important consideration. There will always be at least one person in each group carrying a rifle as well as flare guns (a type of bear deterrent). Since we move from place to place and do not camp on land, there is also no chance of enticing a bear over time into our midst. The reports we hear every couple of years about encounters with polar bears on Svalbard — the most recent being this July — are either with habituated bears close to the towns or far north with tour groups actually seeking out polar bear encounters. Unfortunately in each case the end result has been the destruction of a bear who is usually emaciated, desperate and close to death already. We have chartered the s/v Noorderlicht through Oceanwide Adventures. The Noorderlicht is the ideal vessel for a ski and sail trip. It is 50 m (150 ft) long and has a capacity for 20 passengers and 5 crew. Not too big but also not too small either. Spending a week on a boat it’s nice to have lots of room to move around and a variety of friends to mingle with throughout the week. A captain, second mate, third mate, cook and expedition coordinator are Oceanwide’s staff who will ensure a successful and safe voyage. A very interesting resource is our Virtual Tour of the Noorderlicht. It provides 360-views of the decks, lounge and dining areas, and three of the berths. Definitely check it out — it gives a really good feel for what it’s like on board the yacht. Several other resources are found on the Noorderlicht’s website including a floor plan of the boat and a photo gallery of the Noorderlicht at work.